CDA Breaking News: the E-Fill is being reinvented! E-Fill, for e-liquids, but not only that! The famous Monobloc of CDA has been upgraded with a lot of new features! Created in 2013 to meet the growing needs of the e-liquid industry, the CDA E-Fill Monobloc quickly became a best seller at CDA before entering the market by supplying a large number of e-liquid manufactures. This complete packaging line is acclaimed for its versatility and ultra-compact size that allows it to be effective in the smallest spaces. Capable of filling, tip pushing, capping and labeling, the E-Fill has been able to package bottles from 5 to 250mL (8oz) such as electronic cigarette bottles (glass and plastic). Recognizing the need for many industries in full packaging lines and the potential of E-Fill, the CDA engineering department has reviewed the E-Fill features and capabilities for a 2018 upgraded version. To keep pace with the evolving needs of our customers, the E-Fill has been redesigned to accommodate many more applications beyond just e-liquid. While the Monobloc created for the vaping industry will still play an important role to accurately package small bottles, it is now also able to support many other products from 5mL to 1L (32oz) with a container maximum diameter of 90mm (3 ½ “). To open its performance to other industries such as food & beverage, cosmetics, chemicals … the new E-Fill can be built with 3 different filling systems depending on the viscosity of the product to be filled: peristaltic, piston pump or mass flow meter. The new features of the E-Fill allow it to fill, tip push, screw and label containers larger than before, and especially to ensure the filling of several viscosities. Bottles of syrup, e-liquid bottles, essential oils … the possibilities are numerous. In our warehouse or at our upcoming trade shows, the CDA team will be happy to present you its new E-Fill! CDA engineers do not stop there. 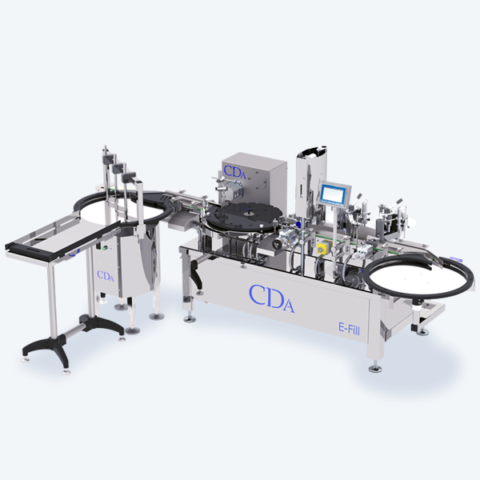 Our team is currently developing improvements for the other CDA star monobloc: the complete packaging line E-Fill S.
Would you like to be informed of our future tradeshows?